Stop ordering out and make awesome Thai food at home! Thai cuisine has a character all its own. It is easily distinguishable from Chinese and other Asian cuisines. Thai cooking balances sweet, sour, salty, bitter, and spicy in its own unique way. This recipe book will help you prepare your favorite recipes, in your home. Most are easy to make without losing that takeout feel. Cooking at home may take more work than ordering out, but itâ€™s always healthier and more fun. Bring the delicate flavors of Thailand food in your kitchen. This book will show exactly how. You will learn how to prepare Thai food like takeout restaurants do and make you an expert at handling Thai ingredients and blending the flavors that make Thailand recognized worldwide for its excellent cuisine. â€¢Ingredients used in Thai cooking, cooking methods and cooking equipment used to prepare the perfect Thai meal. Scroll back up and click the buy for an immediate download! Read immediately on your Kindle, tablet, cell phone, laptop, or computer with Amazon Kindle reading app. Thai cooking, Thai recipes Thai cookbook, Asian cookbook. Asian cooking. Asian recipes, pad Thai, Chinese recipes, Thailand, Thai restaurant. 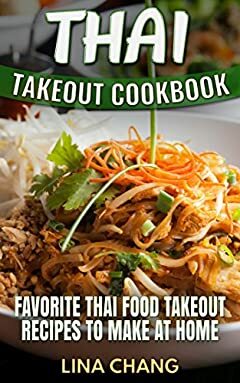 Thai takeout recipes. Thai takeout cookbook. Asian food. Wok recipes. wok cookbook. noodle recipes. noodle cookbook. thai food. Thai cookery. Thai slow cooker.